It is your special man’s birthday and you want to do something special for him that you have never done. You want to buy him flowers to show him how much you appreciate him, but he is a masculine man and may view flowers as too feminine. Keep in mind that while it is unusual to buy a man flowers, there are certain occasions that he may see it as okay. Perhaps he is sick in the hospital and you want something convey Get Well wishes and to brighten his hospital room. Or perhaps it is a very special birthday and you want to show him how special he is. Or maybe it is father’s day and the kids want to buy flowers to show him what a great dad he is. If you have made it up in your mind to buy flowers for your man, then make sure that the hue or colour of the flowers is more masculine than feminine. Hues of blue or deep purple are good for a floral basket for a male. Also, add a touch of something that he may like. Perhaps he has a favourite cigar, cigarette, coffee or chocolate that you can add to the flower basket. Anything that lends to the air of masculinity will help him in accepting the basket wholeheartedly. For the kids, maybe a small balloon that says special dad, or perhaps his favourite candies can be added to the flowers to bring more masculinity to the gift. Keep in mind that feminine colours like pink or anything bright is probably not a good idea. You want to express how you feel in a different way but you still want him to feel like a man when he receives it. Many men are uncomfortable accepting flowers because they feel that flowers are for the man to buy for the woman. But if done in the right way and given with the right spirit, then even the manliest of man will be accepting of a nice flower gift that comes with some of his favourite items. If he is into golf, then adding golf balls may be a good idea. Or placing a gift that will help him with his profession will also make him more accepting of the flowers. Whatever your decision, keep in mind the personality of your man. Is he a bold personality or someone who is quiet and laid back? 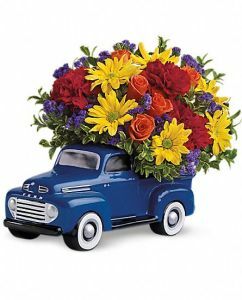 Also, keeping the flowers in a darker brown masculine basket may make him feel better about receiving flowers as a gift. There are also boxes that flowers can be put in, that will show as a more masculine gift. The best thing to help him remember from your gift of flowers, is the spirit of the giving. Let the kids make a great card with special words that comes from their heart to give with the flower basket. Or place a lipstick kiss on a card to present as well to let him know how you feel about him. Flowers for a man can be given for a special occasion, if you make it personal about him with treats that he will love.